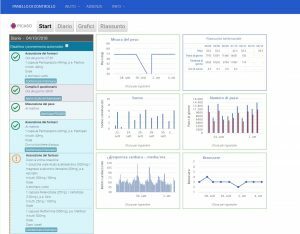 Project partner CNet has been selected as one of 50 finalists for the European Commission‘s Innovation Radar Prize 2018 with the PICASO innovation: Federated Cloud Architecture designed for ehealth: Care Management as a Service. The Innovation Radar Prize is a prestigious prize that puts a spotlight on high quality innovative excellence, emerging from the Horizon 2020 programme. Finalists are grouped into five categories, with 10 finalists in each category, and CNet has been selected for the “Tech for Society” category, recognising technologies impacting society and citizens. “This is an innovation that healthcare has been looking for since cloud technology was introduced. 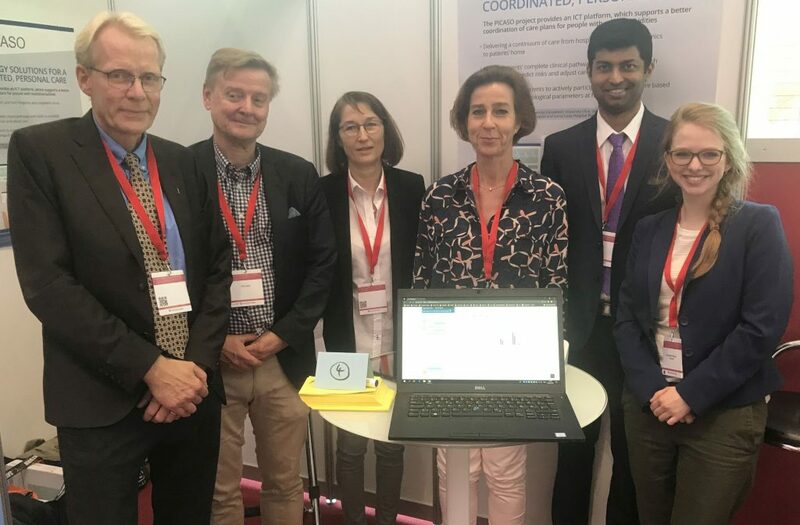 We are very proud to have been selected and it is an important recognition of the innovative work being carried out in the PICASO project”, says Peter Rosengren, technical coordinator of PICASO and CEO of CNet. Thousands of EU-funded innovations from across Europe were scanned in the process, making it quite an achievement to make the final 50. But it is not over yet. The public has to vote for the favourite innovators, who will then pitch their innovation in front of a jury before a winner can be announced. 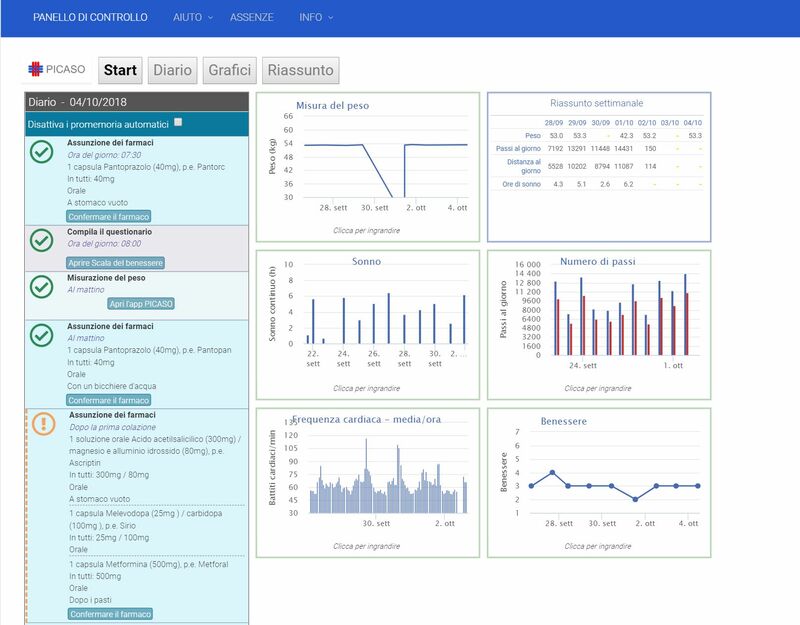 The PICASO platform helps to overcome the core obstacles to a continuum of care which include: complexity of managing large amounts of data, absence of essential patient data and limited collaboration between different clinical domains. It does so by providing healthcare professionals with a comprehensive overview of a patient’s situation and data through a web-based interface and by enabling the creation and sharing of care plans. 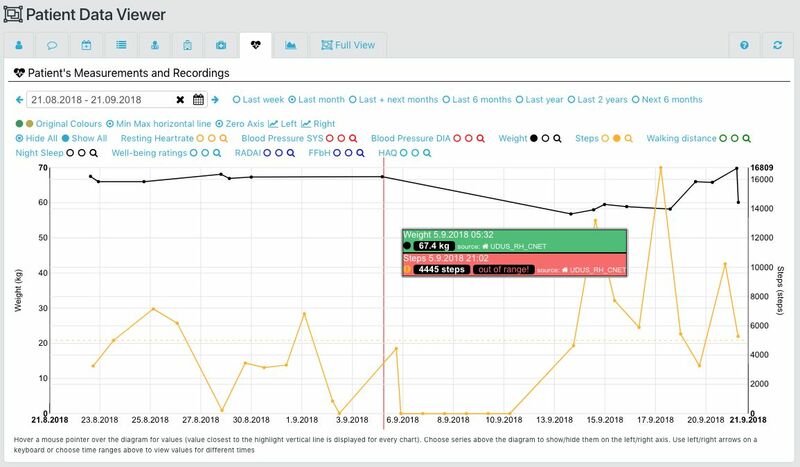 The solution combines clinical, home monitoring and risk assessment data about a patient and gives access to all shared data about that patient. It consists of four main management tools: Patient Data Viewer, Data Resource Browser, Care Plan Manager and Risk Manager. 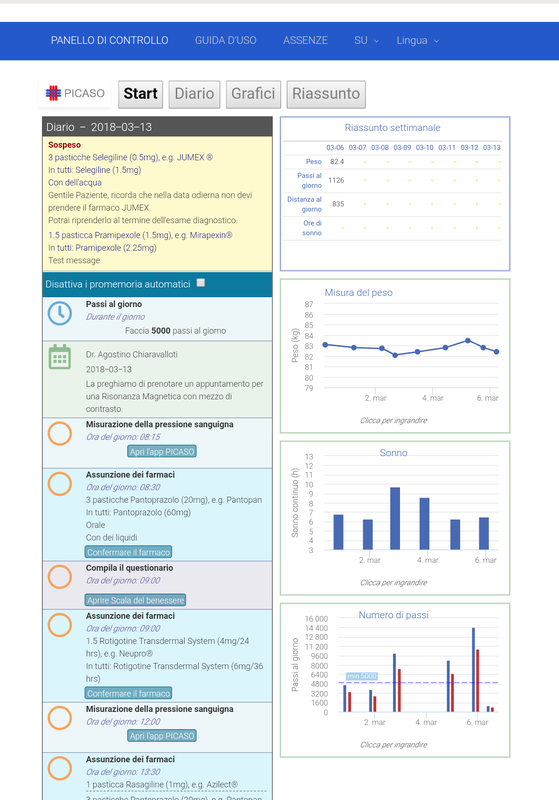 The Patient Data Viewer shows all relevant data about the patient, including basic information and comments, medication and treatment history, visits and appointments. 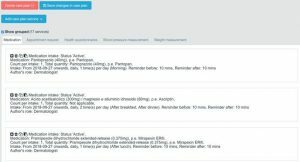 It displays home monitoring measurements and recordings, enabling comparison over time, and a medication adherence score, identifying any non-adherence with cardiovascular medications. Finally, it provides an overview of diseases that the patient suffers from and appointed clinicians. Example of a patient’s measurements and recordings in the Patient Data Viewer. 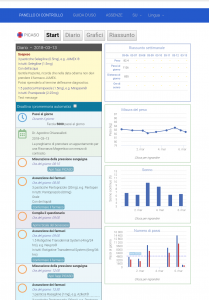 Looking at a patient’s medication history in the Patient Data Viewer. Interactive graphics represent the context of the patient’s treatment similar to a mind map. By clicking on the icons, the healthcare professional receives an overview of available health data. To view shared information about a patient, the healthcare professional can do a search in the Data Resource Browser, yielding a dynamic, interactive mind map of all data that the healthcare professional is allowed to access. 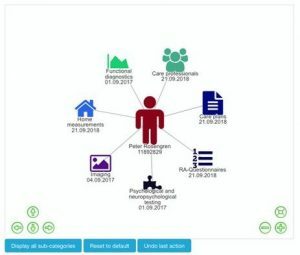 The mind map is shown as a graph where the healthcare professional can click on the individual elements to see the associated information if authorised to do so. If, for example, a general practitioner (GP) searches for data sent by a patient, it is possible to see all the carers who have requested data, and which data the carer has received from the patient. 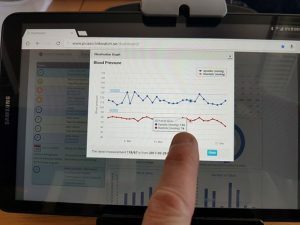 Additionally, the GP can click on a certain data type and see all the measurements performed and also see other carers’ interventions and the care plans executed. In the Care Plan Manager, the healthcare professional can create, integrate and share a patient’s care plan between all involved professional carers. 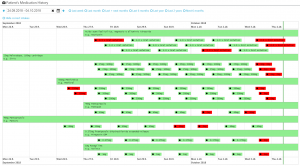 The care plans are stored as templates in a narrative form whereby certain services can be added. In case of medication issues, the healthcare professional is notified by the system and can adjust treatment accordingly. The Care Plan Manager showing an overview of medication prescriptions. To support decision making, the healthcare professional can use the Risk Manager to calculate risk scores based on patient information. For the trials, basic cardiovascular risk scores are used. It is also possible to simulate results based on change of input, e.g. predicting the effect if a patient stops smoking or manages to lower the cholesterol levels. 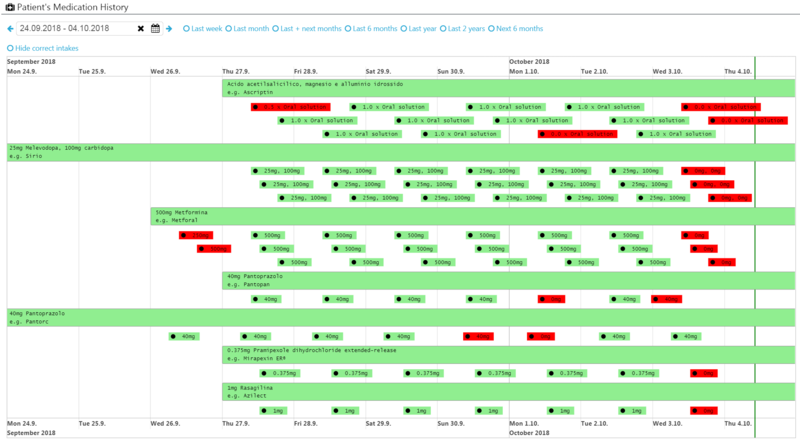 The system is also able to generate health alerts based on the patient data, either to patients or clinicians. However, this is currently not being implemented due to the implications in terms of responsibility. Alerts sent to patients might also trigger concern so it has to be implemented with great care.